Lt. Gov. 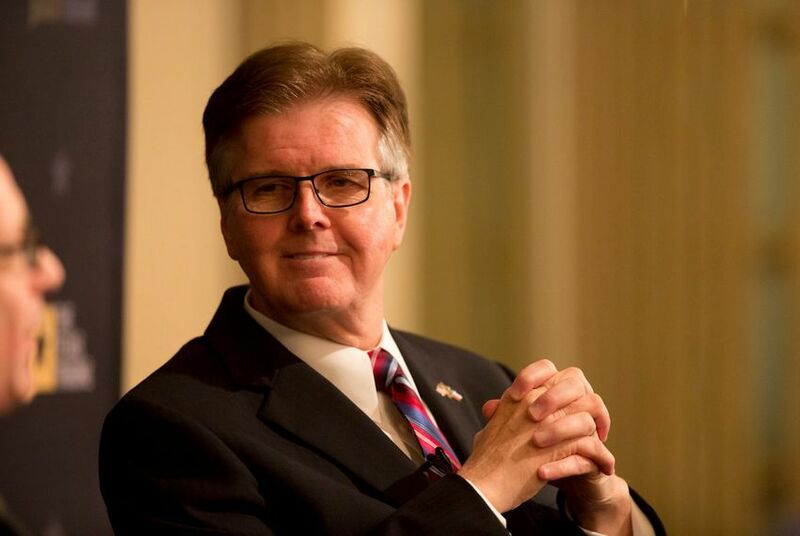 Dan Patrick on Thursday panned the Texas House's budget proposal, suggesting it is fiscally irresponsible because it exceeds Comptroller Glenn Hegar's biennial revenue estimate. Editor's note: This story has been updated to include comments from state Rep. John Zerwas. "The only way the House budget will make any sense is if they raise taxes," Patrick, who presides over the Texas Senate, said in a radio interview. "Not going to happen on the lieutenant governor’s watch — or I don’t think Greg Abbott’s watch either. Or if they take our Rainy Day Fund and spend it on ongoing expenses. That’s not what the Rainy Day Fund is for." Earlier this month, the two chambers unveiled dueling budget proposals for 2018-2019 that start almost $8 billion apart. The Senate's plan would tap $103.6 billion in state general revenue, less than the $104.9 billion Hegar has estimated is at their disposal. The House, however, put forward a budget that would require about $108.9 billion, well over Hegar's projection. At the start of each legislative session, the state comptroller releases a projection of how much revenue lawmakers have to work with. The Texas Constitution requires the Legislature to approve a balanced budget. "I can’t explain the House budget," Patrick said in the interview, which was done with Lubbock host Chad Hasty. "The House budgets money they don’t have. They don’t have it." House Speaker Joe Straus, R-San Antonio, has said he is well aware his chamber's proposal goes over Hegar's estimate. "We know it doesn't balance," Straus told reporters after a speech earlier this month in Austin. "We know there's some tough decisions to be made, and the appropriations committee, once we have one, will start crunching on that. So this is not the final budget, and I'm sure the Senate's budget isn't the final one either, but I think ours is thoughtful, and it certainly includes priorities that we've been talking about for a long time." State Rep. John Zerwas, a Richmond Republican who serves on the Legislative Budget Board, defended the House budget proposal, saying it "accurately reflects the priorities of the state, but with a fiscally prudent situation." He echoed Straus in acknowledging the plan goes over the Hegar estimate but expressed confidence lawmakers will work through it in a responsible way. "I agree," Zerwas said of Patrick's comments. "I don’t think you’re going to see any new taxes, and I don’t think you should use the Rainy Day Fund on anything other than one-time expenses." Facing sluggish economic forecasts, Comptroller Glenn Hegar announced that lawmakers will have $104.87 billion in state funds at their disposal in crafting the next two-year budget, a 2.7 percent decrease from the last session two years ago. In December, state leaders picked a spending cap for the next budget that many lawmakers predicted the state wouldn't have enough money to hit.